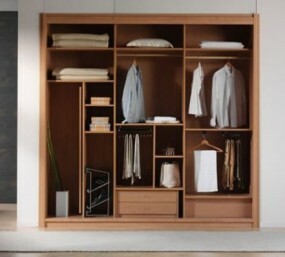 Lunarfurniture.com – Have you ever try to calculate how many clothes which are kept inside your wardrobe? Well, if you really do that, you might be shocked if you find out tenth or hundred layers of clothes and other stuffs inside your wardrobe which might be bought many years ago and never been used at all in recent time. Some clothes are designed to be hold on for years although they are washed, dried, and ironed for many times. For female, this many-clothes problem might be more serious since there are more models and kinds of clothes than male clothes so that it might be women have more clothes in their wardrobe than the male have. We need to do selection for the clothes and stuffs inside the wardrobe so that the unused stuffs or clothes can be moved out from the wardrobe so that there will be space inside and getting less messy inside the wardrobe so that we can easily found the cloth we want to wear than before. Besides of the clothes selection, we can find other solution by making or finding other storage place besides of the wardrobe. This alternative wardrobe will be used as the place where we can put so many clothes and other stuffs like the thick blanket, shoes, books, magazines. Other solution is also can be done by using the plastic racks which can be the storage of the clothes storage or other small items. The stuffs segregation can make the wardrobe to has more space than before and even we can find the clothes or stuff we need easier than before since there’s no more thick clothes stack. We also can find so many items more efficient since there are separated storages.